Jul, the Swedish Christmas holiday, is celebrated throughout December and traditionally until St. Knut's Day on January 13. The main celebration and the exchange of gifts takes place on Christmas Eve, December 24. The Lucia Day is celebrated during Advent, on December 13. Christmas in Sweden is a blend of domestic and foreign customs that have been re-interpreted, refined and commercialised on their way from agrarian society to the modern age. Today, most Swedes celebrate Christmas in roughly the same way, and many of the local customs and specialities have disappeared, although each family claims to celebrate it in true fashion in their own particular way. The origin of the Germanic word "Jul" is somewhat unclear. Around the year 600, it is mentioned in the Gothic calendar together with Christian religious texts. Around the year 900, the word "Jul" can be found in a tribute to king Harald Fairhair, in which someone is said to "Dricka Jul" (Drink Jul). The pretext for the Jul celebration was to mark the winter solstice when the days start to get longer and the nights shorter. In Nordic prehistoric times there was a "midvinterblot" rite (mid-winter blót), which was a sacrificial rite held in mid-winter, which may either mean the same time as Jul (in later sources called julablot), or in mid-January which was in the middle of the winter period. The Æsir sacrificed cattle and perhaps humans to win the gods' blessing on the germinating crop. The ás (singular of Æsir) who was especially hailed at this time was Odin, who commonly went by the name of "Jólner". The Jul was Christianized, while the blót rites were forbidden and abandoned when Sweden became a Christian country. The celebration of Christmas at the end of December is a very old tradition with many origins. Among these is the Old Norse Christmas celebration - which was prevailing in Scandinavia in the 11th century - and was celebrated in connection with the mid-winter offering celebration. Moreover, we have the Christian celebration in memory of the birth of Jesus Christ. The earliest records of these celebrations are from year 333. Eight hundred years later this is merged with the Old Norse Christmas celebration. In the Old Norse sources the pagan celebration of Jul in the Nordic countries is often described as "to drink jul/yule". The central aspect of the pagan Germanic celebration of midwinter was to eat and drink well. To bake and to produce ale and mead were important preparations for the celebration. In medieval wooden calendars and pre-Christian picture stones, this celebration is still symbolised by a barrel of ale, or a drinking horn. So the emphasis on food and drink traditions was originally a pagan trait of the Christmas celebration. The story of the Christmas tree begins in Germany in the 16th century. 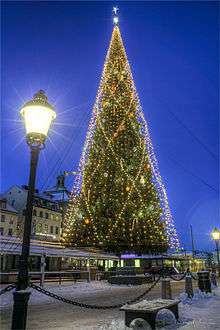 During the 17th and 18th centuries the Christmas tree started being dressed with candles. The first Swedish Christmas trees were generally decorated with live candles and treats such as fruit and candy. Apples were often hung on the branches where the candles were located to make them more parallel to the ground. It soon became more common for families to make their own decorations with paper and straw. Some families preferred to build a Ljuskrona decorated with cut paper. From around 1880, commercial Christmas tree decorations were readily available in larger Swedish cities, the finest of which were imported from Germany. The day that people in Sweden buy and dress their Christmas tree varies greatly from family to family, but most have them dressed on 13 December and throw them out by 13 January. Commonly used decorations today include: baubles, candles, apples, Swedish flags, small gnomes, tasseled caps, and straw ornaments. The house may be filled with red tulips and the smell of pepparkakor - a heart-star, or goat-shaped gingerbread biscuits. St. Knut's Day (13 January) marks the end of the Swedish Christmas and holiday season. Children, especially, may celebrate it with a Knut's party. Jultomten, or just tomten, is the being who brings the gifts at Julafton (the evening of December 24). 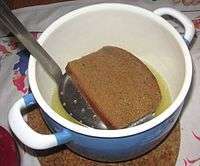 The gifts are called julklappar, and are probably a modern version of the Yule log. Jultomten does not climb down the chimney, he delivers the gifts in person. This task is often performed by an old man who secretly dresses up as Jultomten and knocks at the door with a sack of gifts. The origin of the modern Jultomte is a hybridisation between the pre-Christian being called Tomte and the (originally Dutch) Santa Claus. A Tomte is mostly portrayed as a small, gnomelike spirit being who lives on a farm and takes care of it (or the family) while the farmer family are asleep. He might be a gift giver if the farmers treat him and the livestock correctly. The tomte is an echo of ancient ancestral cult. It is thought that the tomte was considered a spirit of previous generations at the homestead, and there are references to them following the family/clan, when they move. Despite its different cultural roots, the Jultomte (Tomte of Jul) is today portrayed similarly to the commonly known image of Santa Claus. The food you eat at Christmas may still depend on which region you live in the country. But here, too, homogenisation has set in, due in no small part to the uniform offerings of the department stores and the ready availability of convenience foods. Few have time to salt their own hams or stuff their own pork sausages nowadays. 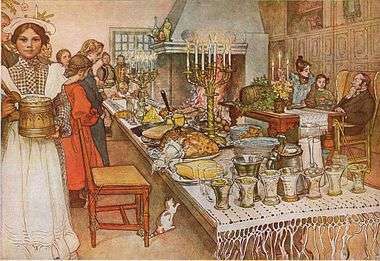 Traditional foods include a julbord which has been prepared with all the classic dishes: Christmas ham, pork sausage, an egg and anchovy mixture (gubbröra), herring salad, pickled herring, home-made liver patty, wort-flavoured rye bread (vörtbröd), potatoes and a special fish dish, lutfisk. The seasonal soft drink julmust is also served at the julbord, as well as during the whole Christmas holiday. A traditional julbord is typically eaten in three courses. The dishes include local and family specialties. The first course would typically be a variety of fish, particularly pickled herring and lox (gravlax). It is customary to eat particular foods together; herring is typically eaten with boiled potatoes and hard-boiled eggs and is frequently accompanied by strong spirits like snaps, brännvin or akvavit with or without spices. Other traditional dishes would be (smoked) eel, rollmops, herring salad, baked herring, smoked salmon and crab canapés, accompanied by sauces and dips. The third course would be warm dishes. Traditionally, the third course begins with soaking bread in the stock from the Christmas ham but this is rarely practised today. Warm dishes include Swedish meatballs (köttbullar), small fried hot dog sausages (prinskorv), roasted pork ribs (revbensspjäll), and warm potato casserole, matchstick potatoes layered with cream, onion and sprats called Janssons frestelse (literally "Jansson's Temptation"). Other dishes are pork sausages (fläskkorv), smoked pork and potato sausages (isterband), cabbage rolls (kåldolmar), baked beans, omelette with shrimps or mushrooms covered with béchamel sauce. Side dishes include beetroot salad in mayonnaise and warm stewed red, green or brown cabbage. Lutfisk, lyed fish made of stockfish (dried ling or cod served with boiled potato, thick white sauce) and green peas that can be served with the warm dishes or as a separate fourth course. Lutfisk is often served as dinner the second day after the traditional Christmas Yule-table dinner.Julbord desserts include rice pudding (risgrynsgröt), sprinkled with cinnamon powder. Traditionally, an almond is hidden in the bowl of rice porridge and whoever finds it receives a small prize or is recognized for having good luck. Julbord is served from early December until just before Christmas at restaurants and until Epiphany in some homes. The ham is first boiled, then painted and glazed with a mixture of egg, breadcrumbs and mustard. Lutfisk is dried ling or sathe soaked in water and lye to swell before it is cooked. Beer and the occasional snaps are common beverages to this Christmas meal. Mulled wine glögg, ginger nuts and saffron buns are served throughout December. Many Swedes who don't regularly go to church do visit the service on Advent Sunday, the Midnight Mass on December 24 or the early morning Christmas Day service (Julotta). ↑ Bandoli.no: Where is the Christ in Christmas? ↑ "Julgransplundring: Rocking around the Christmas Tree". Your Living City. 3 January 2014. Retrieved 13 January 2015.